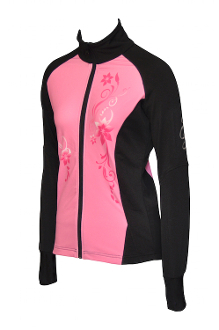 ES Performance Flower Figure Skating Jacket will keep you warm but is lightweight and dries quickly. Made from a polyester/spandex mix with a 4-way stretch, it has thumb holes on the cuffs and a flower pattern on the front and back. Reflective ES logo on the arm. Available several colors in Child S - Adult L.
This is a clearance jacket. Brand new, but the style has been discontinued. All sales are final. No refunds or exchanges.